The “black hole” of reefer monitoring has always been on the water. Historically, carriers have used manual data capture with engineers equipped with clipboards walking the decks and inspecting each reefer’s temperature periodically for set-point deviations and alarms. In the 1980s, power line modem systems for on-vessel reefer monitoring were developed. These systems required that the vessel be equipped with extensive cabling and specialized data modems and all containers had to have a modem. With the advent of standards-based cellular GSM in reefer monitoring, the demand to use GSM on vessels emerged. 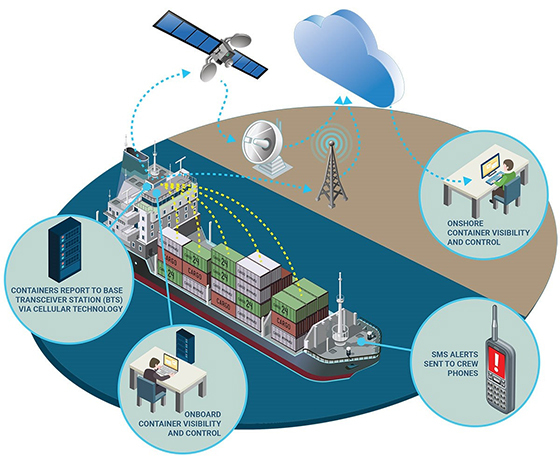 Leveraging advances in wireless technology, ORBCOMM’s VesselConnect enables end-to-end visibility of refrigerated containers transporting temperature-sensitive, high-value cargo across water, filling the traceability gap on vessels at sea. We are looking forward to discussing VesselConnect and our other land-based tracking solutions at Transport Logistic 2017 trade show in Munich, Germany. It is the world’s leading trade fair for logistics, mobility, IT, and supply chain management, and acts as the business platform for and driving force behind the global logistics and transport industry. The event also includes a comprehensive conference program. At the show? We’d love to meet with you. Schedule a Meeting with us and visit ORBCOMM Hall A6, Booth 116 to learn how the IoT can help container assets, cargo and shipments make the move from ‘dark, dumb and disconnected’ to ‘visible, smart and connected’. We’ll also have exciting news to share on our other solutions involving the supply chain. 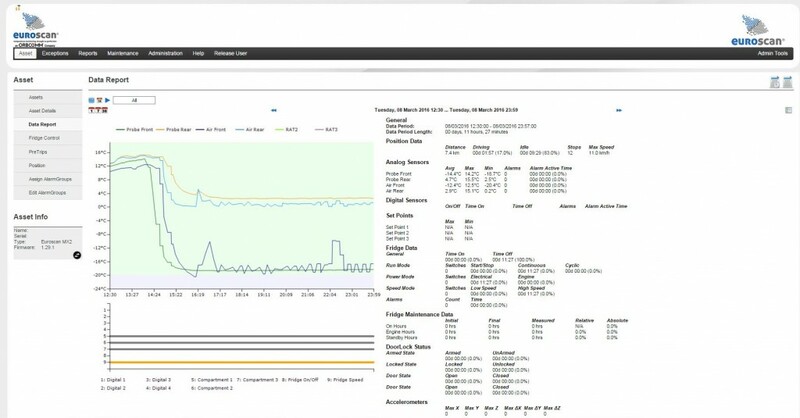 ORBCOMM’s VesselConnect displays critical data from refrigerated containers, including reefer status, temperature and slot location, on an application aboard the ship as well as remotely on land when data is synchronized through the Cloud. Crews can adjust reefer set points and conduct pre-trip inspections right from the application, which reduces manual labor and expedites cargo distribution on land. In addition, the system’s temperature monitoring and record-keeping capabilities enable compliance with food safety regulations, including the US FDA’s Food Safety Modernization Act and the USDA’s cold treatment guidelines. ORBCOMM’s VesselConnect enables end-to-end visibility of refrigerated containers transporting temperature-sensitive, high-value cargo at sea. As telematics in the cold chain are becoming ubiquitous, companies who have been slow to adopt are experiencing increased competition and pressure to meet regulatory compliance. ORBCOMM’s solutions bring visibility and control to transportation companies worldwide, providing maximum compliance, efficiency and return on investment with state-of-the-art reefer temperature management that is revolutionizing operations for food service, rail and intermodal, ocean containers, pharmaceuticals, private fleets and others. At Transport Logistic, you can see a demo of our ReeferConnect application enabling real-time tracking and two-way control of refrigerated containers and cargo, across land and sea. You can also ask us how about the advantages of procuring temperature recorders and cold chain solutions from a GAMP5 validated manufacturer. We will be showcasing our Coldchainview application for real-time monitoring and management of food, pharmaceuticals, live animals, electronics and other refrigerated assets within the cold chain. ORBCOMM’s Coldchainview data view provides a graphical and numerical history of all vehicle data. The period and the data to be displayed are specific and customizable. As an economical alternative to more advanced tracking solutions, ORBCOMM’s XT 4760 is a rugged, compact plug-and-play device that enables two-way monitoring and control of chassis, gensets, flatbeds and other powered assets. In tandem with our web-based telematics application, CargoWatch®, the device enhances visibility into freight management operations resulting in more accurate on-time deliveries, ETAs and in-route location updates for enhanced customer service and satisfaction. For those we won’t see at Transport Logistic 2017 Munich, please feel free to contact us anytime to discuss connected assets and cold chain management. As Product Marketing Manager at ORBCOMM, Craig Bond is responsible for driving marketing initiatives for industry-leading satellite/cellular products and services. He has a diverse range of experience in global business strategy, product launches, market intelligence, brand communications and product positioning.